Dr Bonansea graduated in Classical Studies at the University of Turin, where she also completed a PhD Programme on History and Art History from Late Antiquity to the end of the Middle Ages. Part of her education took place at the Université Libre de Bruxelles, the Ecole Pratique des Hautes Etudes in Paris and the Pontificio Istituto di Archeologia Cristiana of Rome. During these years she studied Greek and Roman history, literature and art. She developed a particular focus on iconography, publishing several articles and a monograph. At the end of her PhD in 2009, after a short experience at the heritage site of Palazzo Barolo in Turin, she worked as an iconographical researcher and author for the history handbook published by Palumbo in 2010. Shortly afterwards, she started her experience in the EU funded projects sector. She worked as a Project Manager at Soges S.p.A. for over two years, both in Turin and in Brussels, until the beginning of 2012, when she moved to London. Here she joined the International Projects team at The British Standards Institution (BSI), where she worked for over two years as a Project Manager responsible for the acquisition and implementation of technical assistance and twinning projects funded by international donors, in particular by the EU. 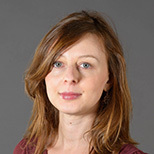 In 2014 the Accademia Nazionale dei Lincei of Rome awarded her a scholarship in order to carry out a one year post-doctoral research project on Greek and Roman art and history, which she has recently completed. In September 2015 she took on the role of EU Bids and Partnerships Manager at London South Bank University in the Research, Enterprise and Innovation (REI) department, and she is currently working on expanding the University’s portfolio of EU funded projects.